Alumni giving is a major source of revenue for institutions, but is also a volatile one that relies on a small segment of alumni. In the recently released Voluntary Support of Education Survey, the Council for Aid to Education reports that individual alumni gave $10.85 billion to colleges and universities in 2015. This reflects 26.9 percent of the $40.3 billion in total support. The percentage of alumni who contribute to their schools continues to hover at 8 percent (as compared with nearly 12 percent in 2007—see this article from Inside Higher Ed for more statistics and trends.). As alumni giving rates decline, it becomes even more critical for campuses to foster the kind of student experience that leads to engaged, active alumni who want to give back to their institutions. How can colleges and universities be sure they are doing that? One of the most effective ways is to take a systematic, strategic approach to improving student satisfaction among currently enrolled students. 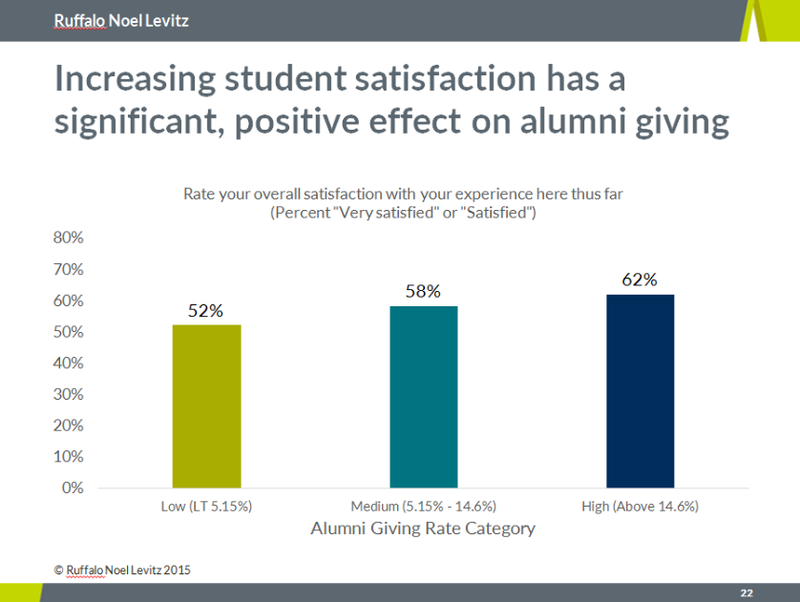 At the end of 2015, Ruffalo Noel Levitz released a study that analyzed the link between institutional student satisfaction levels and institutional alumni giving rates. The data were based on 290 four-year colleges and universities (75 public and 215 private, not-for-profit), reflecting more than 350,000 students who had completed the Student Satisfaction Inventory™. The alumni giving percentages were published by U.S. News and World Report in the 2013 data set. The study tested for correlations between student satisfaction items and alumni giving rates at the overall institutional level. The findings show that as a whole, there is a statistically significant correlation between student satisfaction and alumni giving. As the average institutional satisfaction score increases, overall alumni giving percentages also increase, reflecting that institutions with higher student satisfaction are also more likely to have higher alumni participation rates. This raises an additional question: Are particular areas of the student experience more likely to be tied to alumni giving? To learn the answers to this question, I invite you to download and review the full report. We plan to continue to explore the connection between student satisfaction and alumni giving with a future study on individual student satisfaction and the willingness of graduates to contribute financially and engage with the college as alumni. The focus of this study will be on activity within the first ten years of graduation. If your institution has administered the Student Satisfaction Inventory between 2004 and 2014 and you are interested in participating in this study, please email me. The Threat of Declining Alumni Giving Rates to Higher Education Fundraising (February 23) will dive into the donor decline trend and why this is such a growing, concerning challenge for higher education. 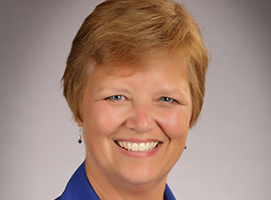 How to Assess Student Satisfaction and Priorities (March 9) will examine how to use student satisfaction assessment to provide for actionable data for student retention and campus planning. I also invite you to contact me if I can be of assistance with satisfaction assessment strategies or questions about the report.